The ‘Settings’ sequence presents a chain of backdrops against which personal events and dramas were played out. 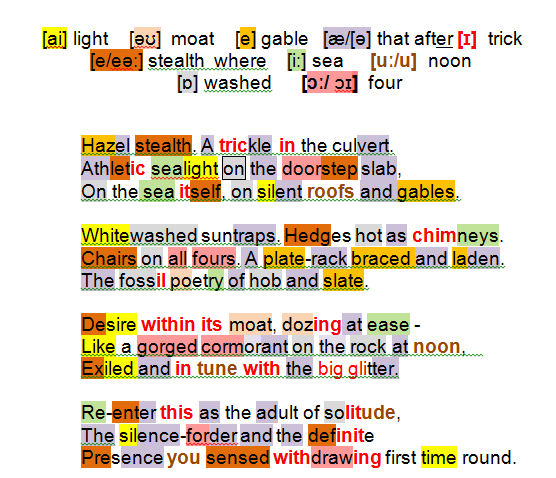 Within the dynamic of Seeing Things Heaney deliberately swooped on anything that stimulated memory or association (DOD 320), willingly transported back by the poems that ‘came on’ to the sites, sensations and moments of primary experience, whence he sets out to give the marvels that emerged the credit-rating they failed to achieve first time round. The rich tapestry of Heaney’s upbringing and his subsequent career and relationships are particularly suggestive of the decorative mountings into which priceless gemstones and rich memories are set both as invaluable personal items and poems of beauty. Settings xiii unfolds within a setting of sun-drenched languor: hints of late summer are detected by the revenant poet’s senses … green leaf pigmentations in slow decline (hazel stealth) … surface water in short supply (trickle in the culvert). Then the seaside location … the weight of athletic sealight on a cottage threshold (doorstep slab), on the ocean itself and the village houses (silent roofs and gables). Everything transmits glare and heat: dwellings are painted to deflect the sun’s power into sheltered corners (Whitewashed suntraps); vegetation is too hot to touch (Hedges hot as chimneys); furniture is in a state of physical collapse (Chairs on all fours). Hiatus within the cottage itself: crockery left out to drain (A plate-rack braced and laden); a treasure-chest of old Ireland (fossil poetry of hob and slate); human passions subdued (Desire within its moat, dozing at ease). Outside, sated seabirds (gorged cormorant on the rock at noon), perching together at a distance (exiled) seem able to cope with the overpowering brilliance (in tune with the big glitter). Enter a man in his early fifties, taking a second peek – an inward-looking isolate (the adult of solitude), creeping furtively back (silence-forder) … once a visitor to this place for sure (definite presence) but failing on that first occasion to appreciate just how extraordinary things were (withdrawing first time round). NC (183): The self is, ‘Fosterling’ tells us, that of a poet ‘nearly fifty’, and the losses are therefore those of common biographical experience; the absences sharpen individual poems into poignancy (leaving a cloud of sadness hanging over them) resolve others into melancholy (leave the poet down in the dumps). Indeed, the losses extend beyond those of death and a traditional metaphysic of interpretation; they extend, in fact, to all of the remembered experiences themselves, and, as such, ‘Squarings’ may be thought to take off from the insights of ‘Hailstones’ in The Haw Lantern. In Settings xiii, the space of childhood may be re-entered only ‘as the adult of solitude’, not in the cheering company of the original; and so on.